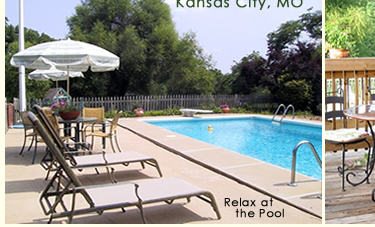 You will find that Su Casa B&B in Kansas City, MO is a wonderful place for your Missouri family vacation. For the most memorable weekend and the best possible rate, reserve ALL THREE guest rooms. Then bring your parents, your brother or sister, your in-laws, cousins, and/or your kids. The two large rooms have queen-sized beds and either a full-length sofa or a love seat, while the third room has a full-sized bed. You can either bring sleeping bags for additional people (limited number), or tell the innkeeper so she can get the airbed ready in the common area for a small additional fee. Then get ready to chill out with just your family at breakfast, in the movie theater, the guest kitchen (with microwave and refrigerator), the game room, and the swimming pool. You can even tell the innkeeper what your family likes most for breakfast! See Packages and Specials for family-style celebrations (e.g. Pizza by the Pool) including tickets to local attractions (e.g. Kansas City Royals, Worlds of Fun). See Attraction page for additional information on fun Kansas City attractions. Traveling to Kansas City for a Family Reunion? Enjoy family friendly lodging at Su Casa with your immediate family instead of at an impersonal hotel this time. 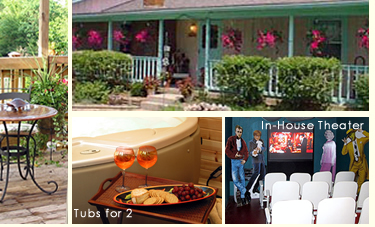 Su Casa B&B is conveniently located to various interstates so that you can get to your picnic or dinner event on time. The best part is you will enjoy yourself in between your reunion events. Children love the game room with its small pool table, foosball game, board games, puzzles and books for kids of all ages. Everyone will love the 20-seat movie theater, with its big-screen television, digital cable, surroundsound, karaoke, and lots of movies, including family-friendly and children's selections. The swimming pool is a wonderful place to interact with your family - whether floating on one of our rafts, lounging poolside or playing water basketball. Children and animals have a unique bond. Your family will love petting and feeding the Su Casa critters - ponies (Pancho and Cisco), miniature donkeys (Butch and Sundance), goats (Fawn and Miss Butters). Don't forget your camera!